Downton Abbey - PG Wodehouse style! Here we have a glorious ensemble of Woodhousian characters knocking elbows to foreheads in the elegant and grand Blandings Castle. Meet Freddy Threepwood, the vagrant son of doddering old Lord Emsworth of Blandings Castle. Freddy has recently become engaged to Aline Peters, the American heiress of an irascible father. The snag is that Freddy seems to have at one point become enamored of a struggling actress, Joan Valentine, and written some impetuous and imprudent letters to her. Joan has now moved on and is currently employed as a writer for a magazine’s society column. Freddy has employed a certain R. Jones, a man of portly and dubious character, to attempt to buy back Freddy’s letters, and keep his engagement safe. We also meet Ache Marson, an athlete who writes the Gridley Quayle series of pulp mystery stories, and also lives in the flat just below the actress/writer Joan Valentine. Got that strait? Sound confusing? Wait till we get going. Choose the format that works best for you! From Denise Bowen of Palm Desert, California on 10/31/2018 . I enjoyed this book tremendously for several reasons. BJ’s narration is top notch; he flows seamlessly from male to female voices and the various accents of each character. P.G. 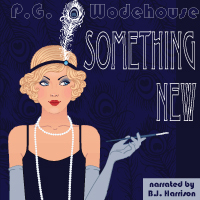 Wodehouse is just a hoot! I love his books and light humor is just what I need! It’s a merry romp both upstairs and downstairs with a (spoiler alert) happy ending. What could be better? Big Jeeves & Wooster Fan! From Tracy of Santa Fe, Georgia on 2/9/2018 . I have several Jeeves & Wooster books, and I really enjoyed hearing this collection of old and new (to me) tales read by BJ Harrison. Thanks to all who work on this great podcast! From Anonymous of Bluffton, Indiana on 2/20/2017 . From Anonymous of Gentry, Arkansas on 3/19/2016 . I think this type of English comedy is one of what Mr. Harrison does best. This was on the podcast awhile ago and I really enjoyed it.